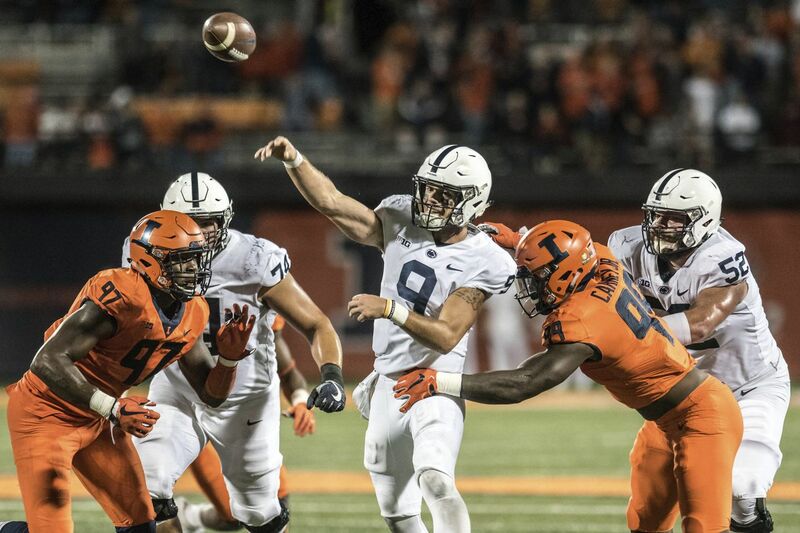 Trace McSorley throws the ball in heavy traffic in the second half of Penn State’s win over Illinois. After a 63-24 rout of Illinois in its Big Ten opener, Penn State inched up one spot from No. 10 to No. 9 the latest Associated Press college football poll. The Nittany Lions could make a jump after Saturday's game vs. Ohio State. The No. 4 Buckeyes are averaging the most points per game of any FBS team in the country with 55.5. Penn State is right behind them, in second with 54.5 points per game. Happy Valley will play host to ESPN's College Gameday ahead of the primetime matchup taking place Saturday night at Beaver Stadium. After a season-high seven ranked teams lost, the back half of the AP poll got a makeover on Sunday. Five teams entered the Top 25, including No. 17 Kentucky for the first time since 2007. At the top it was mostly status quo, with Alabama, Georgia, Clemson and Ohio State staying Nos. 1-4. LSU moved up to No. 5, swapping places with Oklahoma after the Sooners needed overtime to get by Army. Kentucky is unbeaten and 2-0 in the SEC for the first time since 1977. The last time the Wildcats were ranked was Nov. 11, 2007. Duke is ranked for the first time since October 2015, giving the football poll a basketball feel. The Wildcats and Blue Devils were last ranked at the same in September 1957.